Yahoo! Messenger is a great tool for keeping connected with friends, family and others who share a common interest. Some corporations permit the use of Instant Messaging tools because it offers another avenue to grab someone's attention for information in the event you are already on the phone with someone important. Yahoo! Messenger currently has a feature to join a chat room. This is done by left-clicking 'Messenger' on the top menu bar. 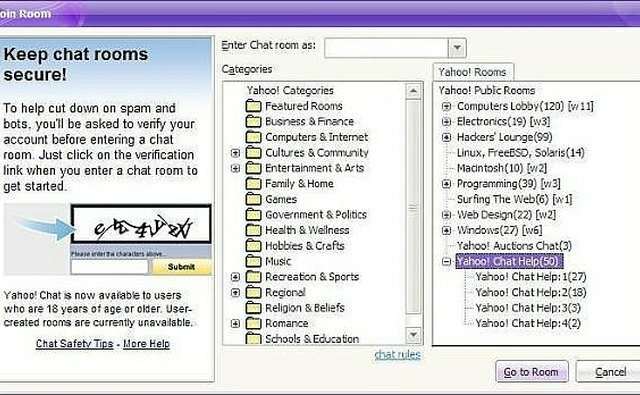 Left-click on the menu item 'Yahoo! Chat'. A sub-menu will open. Click on 'Join a Room...'. When the 'Join Room' window pops-up, select a category, then a room. When you found the room you want to join, click the button labeled, 'Go to Room'. In this example, I chose "Yahoo! Chat Help". 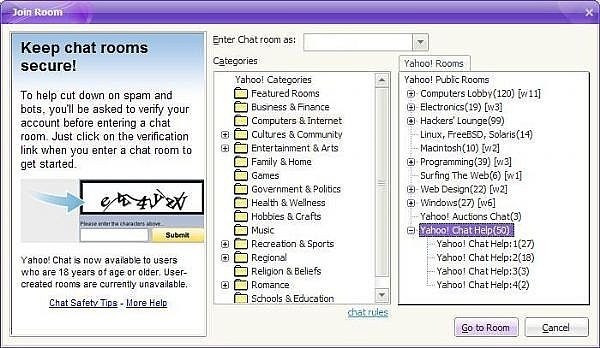 This article title mentions creating a chat room group. As of the writing of this article, Yahoo! currently doesn't have that option enabled. Please refer to their website for additional details. In the event that their website is not available, the text provided by Yahoo! has been pasted into this article. "Can I create a room? At the moment, creating your own chat room isn't an option, but we're working toward providing the ability to set up a room in a way that complies with our Terms of Service. Please stay tuned!" The reference provided in this article to Yahoo! 's website can change at any time, they reserve the right. The author of this article did their best to provide as much accurate information available publicly at the time of this writing.